Home » Delhi news » It's true! Delhi's Janpath now has a trial room. Will Sarojini & Lajpat Nagar follow suit? It's true! Delhi's Janpath now has a trial room. Will Sarojini & Lajpat Nagar follow suit? The lack of trial rooms may be the only downside to scouring the labyrinthine lanes of Delhi's flea markets like Sarojini Nagar, Janpath and Lajpat Nagar for bargains. In our feverish enthusiasm to score the best deals, while also grabbing the season's raging styles, it's always a bummer when that perfect pair of jeans don't fit when you try them on at home! Styledotme's Meghna Saraogi has taken it upon herself to remedy this situation. She has approached the New Delhi Municipal Council to seek permission to set up a trial room in Janpath. And it worked! 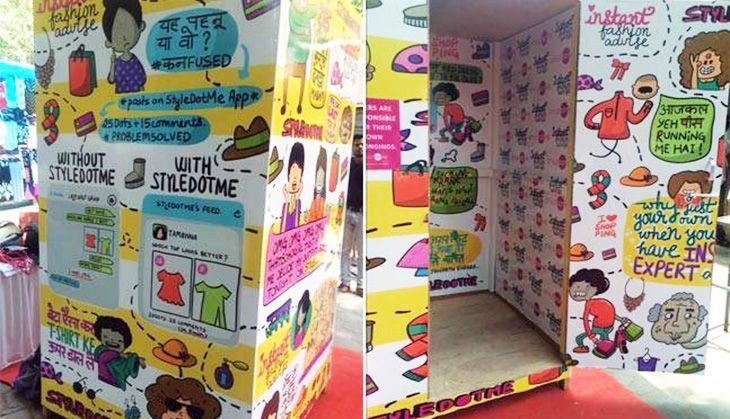 The authorities granted them permission to erect a makeshift changing room in the heart of street markets of Janpath, albeit for a period of two days. A temporary fixture, the trial room at Janpath was an instant hit with customers and sellers alike. Shopkeepers with makeshift stalls at Sarojini Nagar and Lajpat Nagar have expressed interest in having trial rooms installed in these areas as well. "Many customers come to return the garment, with a trial room nearby, it will be really convenient for the customers and us", Yashwant Sharma, a shopkeeper at Sarojini was quoted as saying in a Hindustan Times report. The report also quoted Gunjan Saxena, a 41-year-old homemaker, as saying "I often pick up wrong sizes as there are no trial rooms. This must be made into a permanent feature".